What follows is a long reflection on my choice of fully enclosed backpacking shelters, with a breakdown of specifications, pros/cons, comparisons, applications, etc. There will be a total of four shelter systems reviewed: two modular systems and two tents. Please keep in mind that the weights listed reflect my own personal configurations, such as choice of guy lines, stuff sacks, stakes, etc. There are many different factors that can contribute to a shelter system's total weight. I had previously written about a few of my shelter combinations, but have since updated some things and wanted a lengthier review of all four of the shelters I own and use. I am a section hiker that goes on trips about once a month all year round, and generally hike 20-30km a day on these trips. In addition to my section hikes I also go on the occasional (once a season or so) off-trail trips, mostly to some favorite spots in the woods I am familiar with. All my trips are in Scandinavia, mostly Sweden and some in Norway. I am 183cm / 6ft tall, and am about 83kg / 183lbs. My base weight for each season is usually around 2-3kg / 4.4-6.6lbs in the summer, 3-4kg / 6.6-8.8lbs in the spring/fall, and 4-5kg / 8.8-11lbs in the winter. I've been wilderness backpacking, camping, hiking, etc. regularly for about the past 20 years. And finally, and as always, I am not sponsored by any gear company, nor do I receive any gear for free for the purpose of review or otherwise. These are simply the shelters I decided to buy and use for my wilderness backpacking adventures. On to my big shelter breakdown! 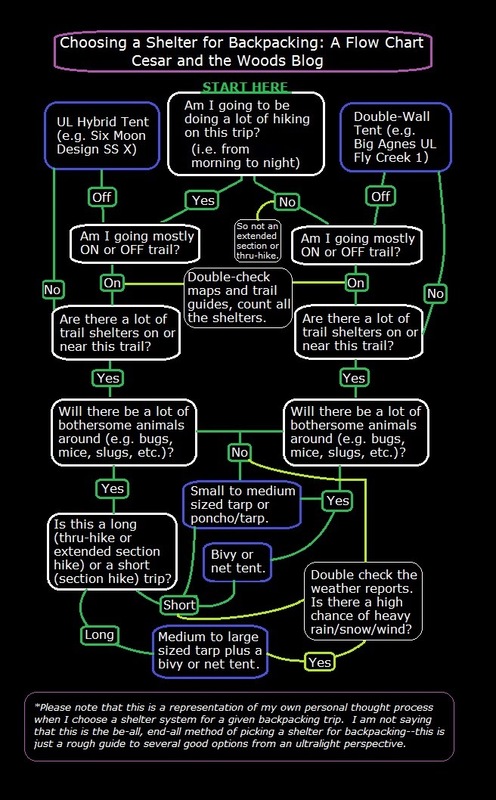 Back in February of this year I made the above admittedly crude flow chart that helps to explain my own personal thought process when it comes to picking a shelter for a given backpacking trip. Ever since then I have wanted to write up a full breakdown of the shelters I own and use (and hence reference in the flow chart), but in addition to being busy as usual, I was also waiting on a final piece of my shelter puzzle. That final piece of gear was a net tent, which I finally received last week and have been playing around with in my backyard. I will hopefully do a quick overnight trip to break it in sometime soon, and plan on taking it along on several section hikes I have planned for this summer and early fall. Now that I have this piece of gear, I have no intentions to buy any other shelters unless I need to replace something that is damaged or worn out. Of course this might change, but I doubt I will be buying a new shelter for a while. This is exactly how I feel about my small collection of backpacks, which I wrote about last summer. So this review will be somewhat similar to that one, only shelters have more nuances that I think require more elaboration and discussion. So get yourself a snack and/or a cup of coffee, this is going to be a long one. So we begin with my newest shelter combination. Obviously I am the most excited about this shelter system because it's the newest, but also because I have put a lot of thought into trying to create the best possible go-to shelter for most of my long distance wilderness backpacking trips. The addition of the net tent is kind of a long story. I had initially ordered and paid for a custom net tent from one company way back in February, and by late May I had still not received it. After much emailing back and fourth with this company, apologies, excuses, etc. I got frustrated and just asked for a refund. 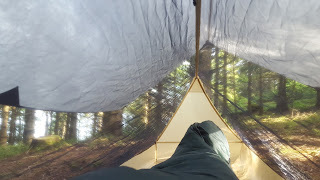 I had a section hike coming up that I wanted to try out the net tent on, and was previously told that I would certainly have it for this trip. Yet as the date came close and still no package in the mail (and none on the way), I had enough. Anyhow, immediately after I got my full refund, I placed an order on May 28th for a Mountain Laurel Designs Solo Serenity Bug Shelter in silnylon, and got a pleasant surprise when it arrived shortly after on June 10th. What a stark contrast from my last order! As some of you might know I am a huge fan of Cuben, but after giving it a lot of thought, I opted to get a net tent with a silnylon floor over Cuben. This is because silnylon is better at dealing with abrasion than Cuben, plus the added incentive of being much cheaper. I have witnessed this great abrasion resistance plenty of times with one of my favorite pieces of gear, my Golite poncho tarp. It's made out of 15D silnylon, which to some is regarded as more "fragile" due to a lower thread count. Yet I've hiked through/past a good deal of brush/branches on and off trail with this poncho and it's still going strong, no holes or damage that I can see. Things seem to just slide right off of silnylon. So based on my own personal observations, as well as what several other Ultralight backpackers have also observed on forums and other blogs, this got me to reconsider silnylon's application in a shelter. I own a Borah bivy with a Cuben floor (another great piece of gear), and have gotten a few years of good use out of it. In fairness to Cuben, the floor has little wear (no holes or damage that I can see), but I always use/used a ground cover and am/was careful about camp selection. Where the bivy is worn out is in the netting, however. I've made a few repairs to it, though it is still in good enough shape to get some more solid usage out of it until I run it into the ground. And when it finally dies on me, I will probably replace it with a similar type of bivy, but with a silnylon floor. "This light, strong and fully waterproof fabric is tested by us - EVERY ROLL. We use our in-house hydrostatic tester on every roll before we build it into products. Our 2015 Silnylon is about 2X the water proffness [sic] of older versions for an even longer service life. " In action on August 2015 section hike, and the two pics below are from the same trip. This shelter system I intend to use year round, and is primarily pitched between two trees in a suitable location in the forest. However if two trees can't be found, one tree and one long stick driven into the ground can also suffice, as will two long sticks driven into the ground, two tripods made out of sticks, and other crafty tarp pitching improvisation. This is also the shelter system I would take with me on a longer hike, such as an extended section hike or thru-hike here in Scandinavia or other terrains with plenty of forests. During bug season the inner net keeps the pests away, and during colder months it helps to keep cold winds and rain/hail/snow off me that might blow in under the tarp. Note that the foot end is full silnylon, as is half of the front end door, plus it has a bathtub floor. This set up is modular, which allows a variety of different options based on the camp conditions for a particular night. For instance, I can use both the net tent and tarp, or just one and not the other, and can be used in combination with trail shelters. Used with trail shelters for instance, the inner tent can be set up inside, while the tarp can be set up as a "front door" or put on top of a leaky roof. I expect to get the most use out of this updated set up as opposed to my other three shelters. I've already reviewed and tested out my Zpacks 6 x 9 flat tarp, so I won't say much more about it, but I will note that this is a size that after many years of using flat tarps I think is just right for a spacious solo shelter for a person of my size or smaller. The MLD Serenity I've set up a few times and gone inside and tried it out, and my first impressions are very positive. The craftsmanship is excellent, and it's fairly straight forward and easy to set up not only in full tent mode, but also in bivy mode for use say inside a trail shelter by simply hanging the front end guy line up from something. For sleeping/laying it has plenty of room for me, and my feet and head don't touch either end. Compared to my two tents, it has more length than my SMD Skyscape X (head and feet don't touch either end at all), much more head and foot space, much less head room when sitting up, and roughly the same width (at least it feels the same). It has a bit more length than my Big Agnes FCUL 1, less width, and less head room sitting up. 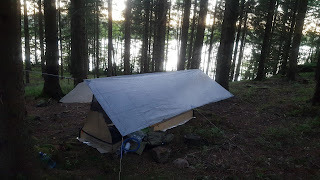 *Update 14/08/2015: I have since been out on a section hike (see: pics above) with the MLD Serenity and Zpacks tarp combo. I absolutely love this shelter system, and it looks to be my go-to shelter for some time. I have no regrets about the slightly heavier Cuben or silnylon fabrics, and both the tarp and inner tent ought to last me a long, long time. I find the size of both the tarp and inner tent to be just right for me, but as I noted before I find a lot of height/head space while sitting up to be overrated. I find I am able to easily change clothing, pack up, inflate/deflate my sleeping pad, eat non-cook foods, etc. inside the inner. And of course no condensation to speak of, as this is perhaps one of the best ventilated shelter set ups in your standard A-frame pitch. It's super easy for me (though experience may be key) to set up and break down. I know that I am probably too excited after just testing it out once in the field, but I really did love it. I like to think I am a bit of a harsh critic, and I am also able to compare my first night in this shelter to my first nights in my other shelters, and I was most satisfied with this combo. This shelter set up, from an Ultralight perspective, is significantly heavier than other shelters I've used in the past. For example, on an XUL trip a while back, my total weight for shelter (Zpacks Hexamid tarp plus extras, which I have since sold) was a mere 216g / 7.6oz. In addition to what I've already mentioned about having a more built-to-last kit, I also wanted more utility and comfort. Not to mention that this is not a fully enclosed shelter, but just a tarp. And after doing loads of research and crunching numbers and generally obsessing about a more refined shelter system for my wants and needs, I realized that for relatively little weight, I could gain significant upgrades in all the things I put more consideration and value into. I mean, we're talking a difference of 524g / 18.5oz between my old XUL (non fully enclosed) shelter and this new go-to shelter of mine. That's about the same as a half liter plastic bottle of water. For most trips I have found that I am fine hauling the weight of an extra small bottle of water in exchange for a tough, roomy, versatile, and full enclosed shelter system. And after all, this shelter combination--if combinations from different companies still qualified, which they don't anymore--would make the weight cut for John Abela's famous SUL solo shelter text/spreadsheet, which includes all fully enclosed shelters on the market under 567g / 20oz. And that's even including all the guy lines. Compared to another shelter that is on Abela's list, the Six Moon Designs Skyscape X (which I also own and review below), this flat tarp/net tent combo is only 135g / 4.8oz heavier; and it comes with several significant benefits, such as being modular, more durable, and more spacious in most regards (other than head room inside the Serenity). But how does my new choice of shelter stack up against say, another popular, fully enclosed Ultralight shelter, just for the sake of having another comparison? Somewhat recently, Chad over at Stick's blog wrote up an excellent first impressions review of the MLD Duomid and solo inner net. The weight of just his Cuben Duomid (431g / 15.2oz) and solo Cuben inner net (213g / 7.5oz), both with his choice of guy lines, comes to 644g / 22.7oz. His total shelter weight with all the extras (stakes, stuff sacks, ground cover, etc.) comes to 842g / 29.7oz. This shelter provides more effective/total coverage due to what is essentially a full 360 degree protection from the tarp, has more room as it is technically a two person shelter, and it is 102g / 3.6oz heavier. Yet I have to say that in a pinch, two people could fit under a 6 x 9 tarp, though it would be tight. But my tarp could work as a two person shelter (not that I would be using it as such), not to mention that Chad and many others use the MLD Duomid as a solo shelter, with the space outside of the inner net acting as a large vestibule. It looks like a great shelter (which is why it was the first thing to come to mind for a comparison), and I had even considered it myself for a hot minute, but for my wants/needs a flat tarp just works better for me than a mid. I like that the Duomid/solo inner net is also modular, so it can be used several different ways depending on the circumstances. And the extra room inside when used as a solo shelter looks very spacious, with about half of the Duomid becoming like a big, enclosed vestibule. However I have a solution to have my own more or less enclosed vestibule, which I demonstrated in a previous post on my shelter systems using my poncho tarp with my flat tarp. My Golite poncho/tarp for some time now has been my main piece of rain gear and goes on nearly every trip. Call it "cheating" if you want, or call it being resourceful, but it's only 200g / 7oz. Many pyramid users use their trekking poles to support their shelter, and the lightest trekking poles that I know about are Gossamer Gear's LT4s, which are 120g / 4.2oz each (or 240g / 8.4oz for two, which is more typical). The trekking poles Chad uses (modified Black Diamonds) weigh in at 379g / 13.4oz. So if most people don't include the weight of their trekking poles in their shelter systems, I don't think I need to include my rain gear in this shelter system--only when the poncho/tarp is the main cover from precipitation, not a door/vestibule. In action on a June 2014 section hike. This is one of the lightest fully enclosed shelters out there, period. Again using Abela's compendium of the lightest shelters on the market as a comparison, this shelter (without the extras, naturally) is 63g / 2.2oz lighter than the top spot on this list, which is the MLD Patrol Tarp and Serenity bug shelter (both in Cuben, of course) that clocks in at 398g / 14oz. But as noted earlier, this list no longer allows mixing and matching of shelter gear--but if it did, my poncho/tarp and bivy combo would be towards the top of the list as far as lightest of light fully enclosed shelters out there. This shelter system has a pretty specific application, but for this purpose it really does shine. It's not the shelter combination I would take with me on most thru-hikes, though there are a few long trails here in Scandinavia that it would actually work great on (Bergslagsleden in the summer comes to mind). I've grown to really love this shelter system and have gotten quite a lot of use out of both the poncho/tarp and the bivy (together and on their own). I bought the bivy used back in February 2013, and also bought the poncho/tarp used back in May of 2014. I use this set up mostly in the warm months of the year here (roughly late May to early September) on trips to familiar areas, or on trips on trails with a fair amount of trail shelters. Though I have brought it with me as my "just in case" shelter on a few winter trips while I was trail shelter hopping. I'd say roughly 75% of the time that I use this shelter system, it's in a trail shelter or cowboy camping with just the bivy. And in trail shelters often both the bivy and the tarp (set up as a front door) get good use (see: below). But I've also used it on its own in light to moderate rain and it's worked well for me (see: above). Sure, it's spartan, and it helps having a waterproof and smaller pack (like my Zpacks Zero) or a waterproof packliner to store clothing/gear, but if you know what you're doing it's actually a pretty solid shelter to keep you dry against the majority of wet weather, and also be bug/slug/mouse free. And it's a great option for a "just in case" shelter for last minute overnight trips in the summer, or for dayhikes, etc. Though if you're over 185cm / 6ft '1, you should look into both a larger bivy and poncho. Unfortunately Golite has gone out of business, but there are other good options out there for poncho/tarps, like MLD, Sea to Summit, etc., and there are plenty of good bivies out there by Borah Gear, Zpacks, etc. One last detail is that like most good modular shelter systems or double walled tents, condensation is either a very small or non issue. However there is an important modification that needs to be taken into account with my particular bivy. Shortly after getting my bivy, I tested it and noticed that there was a lot of condensation inside of it, so I modified it by putting in a vent down the middle of it. This effectively solved the problem, and after putting the vent in I either have no or very light condensation (and only in the foot box). Now let's have a look at my two tents, starting with the one that gets more use. In action on a May 2015 section hike. In action on an August 2012 section hike. I bought this hybrid tent used back in May of 2012, and it has seen a fair amount of use over the years--though my bivy and various tarp combos have seen more use. Its role in my shelter line up is for off-trail adventures in unfamiliar areas or section hikes on trails with relatively few or no trail shelters. On these kind of trips I like to have more of a haven with me for ease of use while sacrificing any modular benefits. It's an all-in-one solution and provides me with space to sit up and a small vestibule for gear, and I don't have to scout for a good spot between two trees, just a flat spot. This also means I can set this up closer to certain scenic spots--like right next to a beautiful lake--much easier than with either of my modular shelters. Yet it is not free standing, so it still needs to be staked out to stand up, unlike my other tent. But the modular benefits are not the only sacrifice. For me this shelter is a bit cramped, and there is only just enough room in the vestibule to fit my pack (and I have smaller packs) and shoes. This is why I carry three extra stakes with me (this tent I use 6 stakes to pitch, but you can get away with only 5), to set up my poncho/tarp if needed in a simple lean-to for a place to cook, change, block rain spray over the door of the tent, etc. My body size (183cm / 6ft) I think is pushing the limits of this shelter. If there is even the slightest of slopes where I pitch it and the ground is not super flat, I can expect my feet or head to push up or rub against the ends of the tent. And this is including always staking out the optional 6th tie out point at one end of the tent. So I would say that this is probably not the shelter for you if you are over 6ft tall, but lengthwise would work quite well if you are around 177cm / 5ft'10 or less. While the head space in the middle of the tent is pretty good even for taller people, I would personally trade a less head space for a bit more length and width. For example, the MLD solo Serenity opts for roomier length rather than head room, and the Big Agnes Fly Creek UL1 is just a tad longer but has much more width but less head room (though more head room than the Serenity). I've set this shelter up in the rain before (from light, to moderate, to somewhat heavy rain), and messing around with the poles and getting this shelter up in a bit of hurry always makes me miss a good flat tarp, which I can throw up with less fumbling around. Experience probably is a big factor here, as I've pitched way more flat tarps than I have my two tents. And in fairness, newer editions of this tent have the poles on the outside rather than the inside, from what I understand. And on the plus side, once you set up this hybrid tent, you're done. You can get in and get away from rain and/or bugs right away, albeit in a smaller space. While a flat tarp I find easier to set up, you still have to get under it and set up the bivy or net tent under it to make it fully enclosed. I also have to add that this shelter has been quite good in general with ventilation/condensation. There is either none or just a bit of dampness inside the tent with one exception: the foot end of the tent. As I noted my feet/sleeping bag will rub up on one end of the tent, so vapor coming off my feet will collect on the end and make it usually pretty damp in this one area. But in the end, this is a great "no brainer," type solution for a UL/SUL shelter. Having a tent requires less planning at the end of the day, as you don't have to be as careful or selective with campsite selection. But in fairness, and as I've mentioned before in writing about pitching flat tarps, I find it fairly easy to find a good spot between two trees in the woods. It only takes me around 5-15 minutes of scouting around some woods for a good spot--a minor inconvenience at worst. This shelter gives me more of a little place to hang out in, which is convenient with its head space sitting up and a nice side door, should I want a little extra time to relax for whatever reason. But honestly most of the time I am not interested in hanging out in my shelter for that long while out wilderness backpacking. But it's nice to have that option at times, especially for so little weight. Again, this is an older model, but you can check out the newest version here. I got this tent as a Xmass gift from some family members back in 2010, and it's been used quite a bit since then--though not in much the past few years, as I've preferred my other, lighter shelters. I hesitate somewhat to call this an Ultralight shelter, but if you are able to get the rest of your base pack weight down, and this is your shelter, it can certainly still be done. I've seen plenty of gear lists of other UL backpackers over the years that include this shelter. And it's no secret why: it's a pretty damn good shelter. I put it up for sale before, but in the end changed my mind and kept it because of this, and also because it has some sentimental value now that I've had it all these years. But sentiments aside, it offers great protection and a fairly spacious area for one person (under 6'1 I'd say). It doesn't have a ton of headroom, and your feet might rub on the footbox a bit if you are around my height, thought I don't feel like I am pushing the limits of this shelter like I am with the Skyscape X. However if I were any taller I would want a longer shelter. Aside from a few aspects, when I compare this tent to my SMD hybrid tent, I find the Fly Creek UL1 to be generally better. For me it's faster/easier to set up, and I've done so on several occasions in heavy rain. It has much more living space inside the inner tent and slightly more room in the vestibule. In fact, I can (and have on a few occasions) fit two adults inside this tent for the night--though of course it's a tight squeeze. Being a double walled tent it has very, very little problems with condensation and a good amount of room in the foot box, and the foot box itself has a little vent, which keeps your sleeping bag and the inner tent drier. I can't even remember a time I used it that it was wet from condensation--a tiny bit damp at times is all I can recall. There is less head room when sitting up than my other tent, but much more width and head space when laying down. I can sit up and chill out without any issue in both tents, though there's more literal elbow room in the FCUL1. One big benefit this shelter has is that it's free standing, so it can be set up pretty much anywhere. There have been times I've set it all up, but then decided to move the tent to a better location, then just taken out the stakes, picked up the tent, moved it, then re-staked it down without any fuss. However where my other tent blows it out of the water is obvious: the Skyscape X is a full 384g / 13.5oz lighter (total weight). Another advantage I also find with the Skyscape X over this tent is the side entrance design. I just find it easier getting in and out of a tent from the side rather than from the front. Yet for me this does not apply to a net tent under a tarp, I would add, as there is some room (or at least there should be) between the door of the net tent and the edge of the tarp to protect you a bit from any precipitation getting in and out, plus space around the edges to store gear or even move around if needed. And as I mentioned before, as soon as I set up my tarp I am protected, and can relax and take my time setting up and getting into the net tent under the tarp. For me, this is my shelter of choice when I am less concerned about weight and taking it easy, and even take it on car camping trips with my family, where one of my kids (they are both under 6 years old) and I can sleep in it comfortably. So for shorter backpacking trips where I know the weather might get ugly, or for shorter off-trail hikes (e.g. 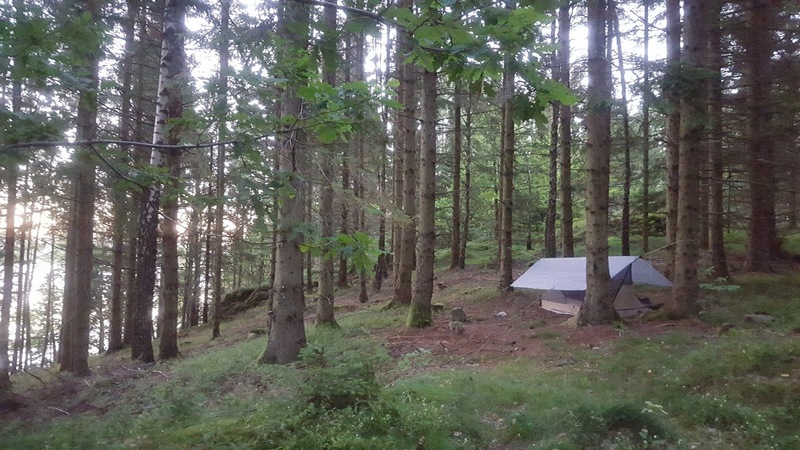 last minute weekend overnighter) to secret locations where there are really nice spots to camp without any trees around (e.g. in a hidden glade, on the shores of an isolated lake, etc.). There are just times I want to spoil myself with a slightly more convenient, spacious shelter on overnight trips; however I have yet to take it on any extended section hikes, where most of the time a modular systems wins out, or occasionally the Skyscape X. That being said, I have seen some thru-hikers that have taken this tent on their trips. So if weight is not that big a deal to you, you don't want/need a modular shelter, and you are under 183cm / 6ft tall, this might just be your dream shelter--but make sure to compare it with other light double walled tents out there, of which there are many. I hope that this quadruple review and the rest of my ramblings are helpful and/or enjoyable. All four of these shelters have worked great for me and my pretty demanding expectations when it comes to backpacking shelters, and I'm beyond satisfied with each of them in their own way. I've been doing this whole sleep in the woods thing for a fair amount of time now, and have put quite a lot of thought into exactly what I expect and want a shelter to do. 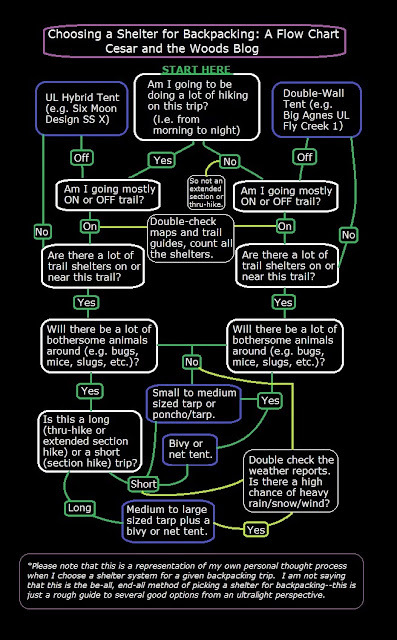 So when I evaluate which shelter I think is best for a given trip, honestly I never have any regrets out in the field on my trips. And finally here are the times it took me to pitch each shelter for my video reviews, in order from fastest to longest. Note that all set up times include getting them out of stuff sacks, adjusting guy lines, etc., and that each time I set them up at a relaxed pace in more or less ideal conditions (fair weather, flat ground, etc.). Also keep in mind that the MLD Serenity is new to me, so with time I will be able to set it up faster. If you own any of these shelters and have any feedback, tips, etc. feel free to share them in the comments below. And if you are thinking about buying one of these shelters or something similar, feel free to ask questions. I hope this big breakdown is helpful, and if you do end up buying one of these shelter systems I think you'll probably be happy with them so long as you give proper consideration to your wants, needs, body size, and where you plan on using it. Update 24/06/2015 -- Added final video and pictures, as well as fixed up and edited a few things. Update 25/06/2015 -- Added set up/pitch times for each shelter, fixed up some minor formatting. Update 14/08/2015 -- Added update on MLD inner tent and Zpacks tarp combo, plus pictures from the section hike I used it on.